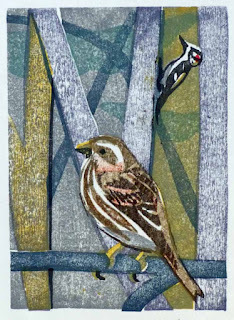 Purple Finch and Hairy Woodpecker. Moku Hanga print by Ken Januski. Edition not complete as of 02.10.19 but it will be between 20 and 25. Printed on Echizen Kozo paper. The title is true and accurate but it's possibly misleading. I did make my first moku hanga print at the beginning of 2017. I did that largely because I'd seen the prints of one wildlife artist in particular who used and still uses moku hanga to make brilliantly colored, quite creative prints. His colors in particular seemed to offer something richer than what I was getting in my previous linocuts and woodcuts. I'm not naming names here, more for privacy reasons than anything else, of that artist or of another family that was also instrumental in my deciding to try moku hanga. The family bought a large number of my works in late 2016 and it was the proceeds of those sales which helped to fund most of my early moku hanga supplies. So I first should say thanks to both the artist and the family. If you read this I imagine you will know who you are. Back to why the title might be misleading though. The fact is that the print at top of this post is only my sixth moku hanga print!! What can I say? As soon as I tried my first moku hanga print I loved the possibilities that I was now seeing first hand. On the other hand when I made that first print technical difficulties required me to yell out to my wife that I'd have to skip lunch and then as the day went on I had to yell out again and ask if we could delay supper. Everything went wrong!! The paper was too wet or too dry. I had all sorts of splotches in my print rather than the smooth, rich, even color I was expecting. My fingers got paint on them and they went onto the paper. I can't even remember everything that went wrong. I do know that the prints did not look as similar to one another as I would have liked(that is an understatement!!). But still the possibilities were obvious. In other words I was hooked. I haven't done any other types of printmaking since then. But given all the problems I encountered I knew that I would have to modify what I did in moku hanga to some extent. For one thing I wasn't going to be able to carve small outlines around every shape. If I'd taken a course I might have learned this right off. But I learned everything from books and trial and error. Anyone who does moku hanga printmaking I think will tell you how complicated it can be. There are so many variables, so many things to learn, and such a rich tradition to contend with. To make a long story short I had to learn how to approach moku hanga in a way that made sense for me. It's also true that after an initial start in printmaking of just using anything as a subject I've gotten more and more ambitious. I want my prints to some extent to be the same as paintings, just done as multiples. So I wanted ambitous prints, but using a medium in which I was a rank beginner. The end result is that it takes me a long time before I decided to actually make a new print. I may spend months toying around with various possibilities. So.................. that is why I say that this is my third year of making moku hanga prints. It's 100 percent true. I just haven't done many during that time. I think that the first print in which I haven't felt the need to tear my hair out as I printed the edition is this one of a female Purple Finch and male Hairy Woodpecker. I had few if any problems in the first edition of 20 on Nishinouchi paper. Well major problems I should say. There were some minor problems, like ink coverage. But the new, as yet unfinished edition on Echizen Kozo, printed at top seemed to have fewer problems with ink coverage. Until the paper seemed to pull off the page as I printed additonal prints!! I think that problem is resolving itself and so all in all this will be a second edition of about 20, with, I hope, better ink coverage. Printing the Purple Finch has been the first time that I've largely liked the process. I'm not screaming and tearing out my hair as I print part of the edition each day. And I'm quite happy with the results. So as I start my third year of moku hanga I have to say it seems the perfect medium for me as a printmaker. I don't need to use toxic chemicals. I don't need a printing press. I don't need a lot of room. I do all my printing in my very small studio(once a bedroom). I think all artists hope for the day when their tools become an extension of their hands. That is now the case with me and moku hanga. There are still a million ways I'm sure in which the technique can become better and more predictable. But it is predictable enough right now. I feel very fortunate to have stumbled into moku hanga. I should add that this print was based on an actual scene at The Wissahickon Environmental Center in late 2018. It is based on sketches and photos I made on a very misty, foggy day. I've tried to keep some of that sense in the print.